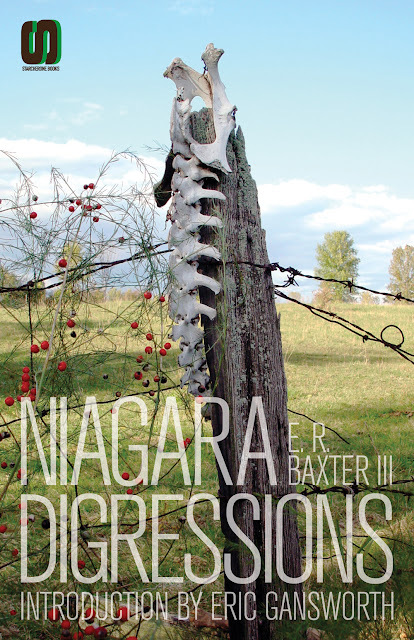 E. R. Baxter III, Niagara Digressions, Starcherone Books, 2012. "It took me seventy years to write Niagara Digressions," says E. R. Baxter III, a lifelong resident of Niagara County. Niagara Digressions is an "indirect memoir" via cut-up method, a rich fabric of familiar and unappreciated histories mingled with the personal, from ancient cave paintings to 1960s mimeographed poetry, the massacre of the buffalo to the manufacture of shredded wheat cereal, and all-points in-between. As well, it is a naturalist's meditation on land as the canvas upon which all the stories are painted. Everybody thinks they know Niagara, but not this Niagara. E. R. Baxter III is a tour guide who knows the indirect path offers the best views."